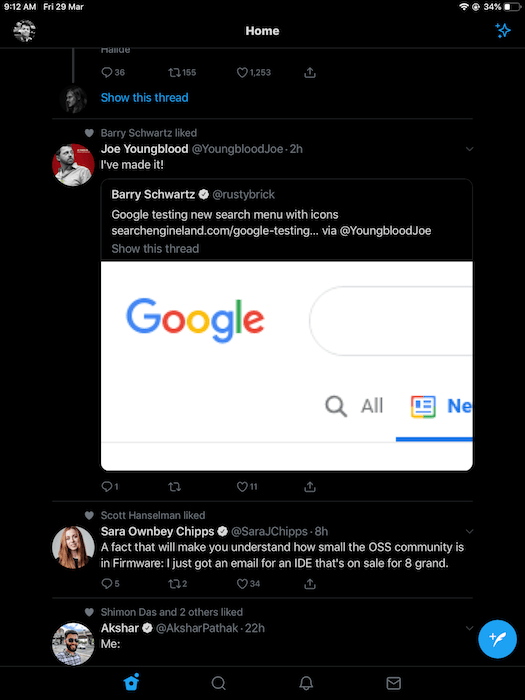 Twitter app for iOS is now updated with a dark mode that replaces the old night mode. The new dark mode features two options – Dim and Lights out, that provides users with more control. 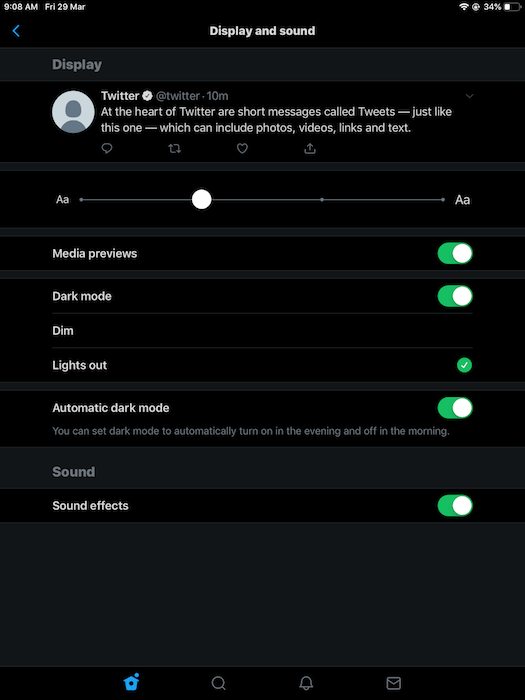 Twitter has also added a new automatic dark mode setting to its iOS app, a feature already available on Android. The update seems to be a server-side rollout and is now being pushed to the iPhone and iPad. Let’s see how to get the dark mode on Twitter and its functionality. It’s worth noting that the new dark mode is currently available only for iOS devices. To get lights out on your iPhone or iPad, follow the steps below. Make sure you have the latest version of Twitter installed. Open Twitter and look for the “light bulb” icon in the bottom left. Alternatively, go to Settings and privacy > Display and sound > Dark mode. Force close Twitter app and re-open it if you can’t see the dark mode setting. To force-quit, hold and swipe up from the bottom to open the recent apps menu. Swipe the Twitter app in the upwards direction to force close. 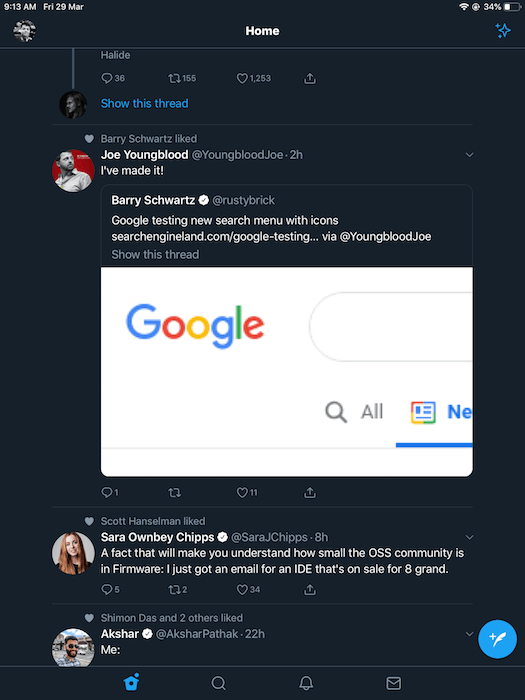 Open Twitter again and the dark mode should be enabled. If the option isn’t enabled yet then Twitter might be still rolling it out in your region. 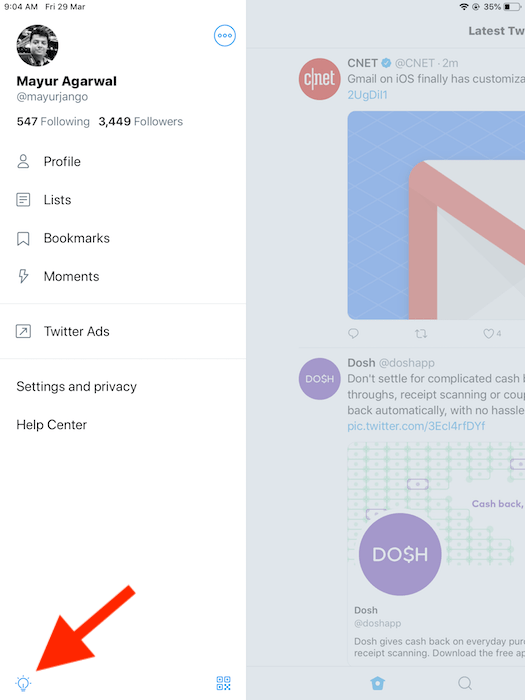 Dim – Twitter has renamed the older night mode to Dim. The dim setting switches the colour palette to a blue and dark grey colour which is comfortable to use in any environment. It basically filters out blue light and reduces eye strain in dim light conditions. Lights out – It is an entirely new mode that is OLED-friendly too. Lights out is a pure black theme that emits no light because it turns off unused pixels. It’s much darker than the Dim mode and is best suitable for people who prefer a true black theme. It should also help in saving battery life on smartphones like iPhone X, iPhone XS, and iPhone XS Max that feature an OLED display. Automatic dark mode – When enabled, this feature automatically turns on the dark mode in the evening and turns it off in the morning. What’s interesting is that it works according to the location and timezone of the device. To enable or disable the dark mode manually, swipe right and tap the “light bulb” icon at the bottom left. Alternatively, head over to Settings and privacy > Display and sound. Turn on the dark mode setting and select either of the two modes – Dim or Lights out. You can also enable the setting for the automatic dark mode. There is also a much faster way to access dark mode, switch between dim and lights out, and turn on/off automatic dark mode. To do so, swipe towards right and long-press the light bulb icon at the bottom. A display mode setting will now pop up, allowing you to make the changes quickly. Meanwhile, Android users would be happy to know that the lights out feature will be available soon on Android.